Pistachio also commonly known as pista is basically a kernels which is generally obtained from fruits belonging to the family Anacardiaceae in the genus. Pistacia is a plant which is basically a medium sized broad, bushy, dioecious, deciduous tree, which is generally originated in the mountain ranges of the West-Asia and Turkey region. Various cultivars exist but the most popular variety is generally grown for the commercial purposes is kerman. It is also known as Pista. First lets see the taste, size and color of pistachios. 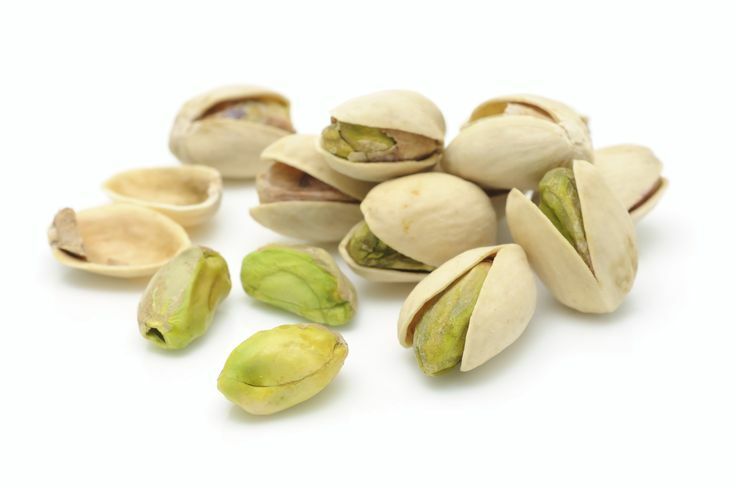 The color of pistachios nut is green and the size is around one inch (2.5cm) long. It taste delicate, rather almond like taste. Pistachios nuts are generally consumed raw or roasted and salted and are also used to decorate the cakes or used as a pressed for a greenish oil used to flavor candy, ice cream or sauces. Pistachios are rich source of fiber and also consist of protein, B vitamins and various minerals. A cup of raw pistachios consists of 13 grams of fiber, 25 grams of high-quality protein. It is also rich in thiamine, vitamin B6, copper, manganese, phosphorus, magnesium and iron. It is effective in lowering the bad cholesterol, LDL and is effective in enhancing the good cholesterol, HDL will help in preventing the heart diseases. It is also effective in enhancing the strength of the nerves which will make heart stronger. It is good for those people who want to loose weight. Because of the presence of lower calories, high protein, low saturated fat, and high unsaturated fats and it is considered best nut and ideal for weight management. It is rich in Vitamin B6, which is necessary for production of hemoglobin, which, in turn, will effectively supplies the oxygen to the cells, also enhances the amount of oxygen which is supplied. This vitamin is also effective in fostering the immunity, also effective in production of red and white blood cells. Glands i.e. spleen, thymus, etc will become healthier and will work properly with better supply of blood consisting of more white blood cells (WBC) which is essential to fight against the infections. It is rich in phosphorus which is about 60% of the daily recommendation. It is effective for glucose tolerance and it is effective in breaking down the proteins into the amino acids. Thus this dry fruit is good for the diabetic patient. This dry fruit is rich in vitamin E, which is a fat soluble antioxidant, Pistachios is effective in maintain the hale and hearty skin. This dry fruit will protect your skin from sun damage, thus by lowering the odds of skin cancer and sunburns. Other Health Benefits of Pistachios includes it have Anti-inflammatory Property, it is good for nervous system, good for macular degeneration, act as anti-ageing, act as natural moisturizer, makes hair strong, good in increasing the flexibility of hair and also it is good for healthy brain . How much you should intake Pistachios per day? On regular basis consume 30 grams of the pistachios if you want full benefits. Do not do overeating or consult your health practitioner if you feel any problem or allergy.